In a game that nicely summed up the woeful lack of quality in this division, Charlton were edged out 1-0 despite arguably being the better side. Given that Swansea were the better side last weekend, I suppose a haul of 3 points from 2 games might be considered fair. Pards preferred Racon to Holland, whilst Moutaouakil paid the full price for a rather tepid Cup performance, but otherwise his team selection sprung no surprises on a windy day in one of Hertfordshire's less salubrious towns. There are certain similarities between these two clubs, evidenced by a 'family' atmosphere, a gradual development of a previously ramshackle ground, and a sense that fighting Premiership forays were somehow 'above their weight'. At least in the case of The Valley however, our last remaining undeveloped end is firstly behind a goal (and thus ideal for dumping away fans), and second still operable. Vicarage Road's current three-sidedness makes for a decidedly lukewarm atmosphere, and with financial constraints likely putting its development on hold for some time, this will remain a blight on their ground for the timebeing. About 1,500 noisy Addicks made the relatively short trip, and most are probably now wishing they hadn't. Despite the wind arguing for a more cultured approach, both teams were soon lofting long balls in the general direction of their strikers, and clearcut chances were as rare as songs from the home fans. Not surprisingly therefore, the only goal came from the first long ball that either defence had failed to deal with. Jonathan Fortune seemed to mistime it, allowing the ball to bounce into the path of Tommy Smith who finished calmly past Weaver's left hand. A minute before half-time, the game's other turning point also arose from another hopeful punt forward, Youga accused of felling Priskin outside the box, and once the foul was awarded, I feared the worst for our wild-haired full-back. The rules state that a red card must be awarded if a defender denies an obvious goal-scoring opportunity. Notwithstanding any question marks over whether the quality of the striker concerned should be taken into account (should any foul on Luke Varney be considered for instance? ), it seemed rather harsh. It wasn't clear that Youga was the last man (there seemed to be at least two defenders alongside him), and it wasn't even clear that he'd even fouled him. Had the incident occurred inside the box, the ref may have concluded a penalty was punishment enough. As it was, it seemed to stir us into a rousing fightback because we played our best football after the break. Bouazza was sacrificed at half-time to restore balance (he was reassuringly described to me by a Fulham season-ticket holder as 'useless'), with Pards not tempted to play just one upfront. At least we have a manager who is prepared to 'go for it' in situations like this, evidenced again when he later removed Semedo for Dickson, pushing the attack-minded Sam to right-back. Varney failed to convert our only clear-cut chance of the half, threaded through the middle of the penalty area, he could not get sufficient purchase on his shot to beat Mart Poom, though he had to hold off a defender at the same time. Thereafter we continued to press (whilst leaving understandable gaps in defence), and despite Dickson looking lively, and Bailey dictating matters in midfield, we could not make any of our pressure count. 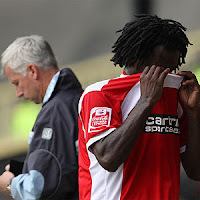 The worrying injury to Racon capped a disappointing afternoon, particularly as he had been impressive up to that point. Based upon the three games I have seen, we look a comfortable midtable side, but little more at this point. We are not creating enough chances (no goals from open play this season), which puts too much pressure on the defence to keep clean sheets. Occasionally our football shows glimpses of promise, but too often we fall back upon a hopeful punt or speculative cross, rather than patiently keep possession to find openings. Our two forwards never seem to receive quality distribution to feet; the addition of Bailey should at least help in this regard. Dickson 6 - heads to goal whilst Varney heads to the corner flag; which would you prefer? If Varney wants to run the channels, then let him run the channels. Give him a free role coming from wider & deeper positions, he can run with the ball and/or cross - at least he won't be continually caught offside, and will be elusive for defenders to pick up. That's how Pards played him when we beat Palace at home - he scored 2 fine goals and tore their defence to shreds. Then Dickson can play off Gray and hopefully show us a poacher's instinct. We must play players to their strengths. I mostly agree, but I thought Lloyd Sam played really well in the second half.